Ian Paisley MP has this week welcomed the news that a significant number of local projects have benefited from the Big Lottery Funds’ ‘Awards for All’ programme. There were in fact eight different groups across Ballymena, Ballymoney and Ballybogey who were successful in their applications to the scheme. In Ballymena the North Ballymena Community Cluster received £6527. The Community Cluster represents and supports a number of voluntary and community groups in the north Ballymena area. They are using the grant to run a series of activities that will bring older people together such as lunches, gardening, arts, crafts and away trips. The Ballymena Substance Users Support Group were awarded £8511. The group supports people affected by drug and alcohol misuse in the town. The grant is being used for training that will increase the support they can provide to the group’s members, equipment and activities such as cookery classes. The Ballymena Inter-Ethnic Forum were also awarded over £8000 to help them with the services they offer to the ethnic minorities in Ballymena. The project will provide bi-lingual interpreters to signpost members to support and information services, as well as supporting the group’s users to integrate into the local community. Rasharkin Community Association received £3596 to help them provide a range of social activities for local residents. They are using the grant for a programme of events, which will include hip hop dancing, floral art and table tennis, which will be promoted at an open evening to mark the community centre’s re-opening. Ballymena Academy also received £8000 to go towards purchasing new outdoor gym equipment that will be accessible to pupils, parents and the wider community. 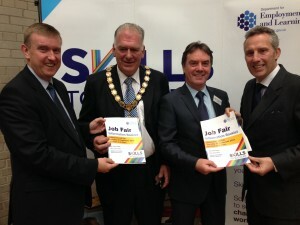 Two grants were also awarded to Ballymoney organisations and one in Ballybogey. Fuse FM is a community radio station in Ballymoney who were awarded £10,000. The grant is to be used to bring local people together through two fun days, one in winter and one in summer as well as a Scottish ceilidh. The town’s Bowling Club also received £10000 to go towards improvements to the club building to allow wider community use, while the Ballybogey over 50’s Club received £9318 to provide classes and social outings for older people in the community. The grant will specifically cater for trips, craft and community classes as well as a monthly luncheon club. Ian Paisley MP has spoken out against the Treasury for the ‘alarmingly slow’ rate at which compensation is being paid out to victims of the Equitable Life scandal. The Treasury achieved a surplus of £8.8 billion at the end of January when only £6.5 billion was predicted. Various MPs supported Mr Paisley in his calls for a proportion of that money to be put aside to help in speeding up the process of fully compensating all the victims of this scandal. I have been officially notified this morning that the Tesco store on Church Street in Ballymena and two other stores in Belfast are to close on 15 March. This will effect 16 employees. I understand these closures are part of 43 closures being announced across the entire UK as a result of profit share loss in the companies annual returns. Ballymena’s large flagship store at Ballykeel is “fine” according to Tesco whom I spoke with this morning. The closure of the express store is a blow to city trade in Ballymena town centre that is finding it increasingly difficult to attract new businesses and keep the town centre thriving. I am calling on civic and business leaders to meet with me and discuss ways to improve the offering that Ballymena can boast. Obviously anything that potentially damages the town centre must be avoided and anything that promotes it must be encouraged. I understand that the 16 employees in Ballymena will be offered the opportunity to re-deploy across the company. Speaking this week in the House of Commons on the Stormont House Agreement, the question of what the specifics of the ‘asset sales’ that had been agreed to be retained entirely by Northern Ireland were. The Secretary of State responded “It is important that the Executive give proper consideration to those and all other assets of a similar nature, but it would not be right for me to prejudge what sale proposals the Executive might develop. Each asset will be considered in relation to the provision in the agreement’s financial annexe. North Antrim MP Ian Paisley and The Department for Social Development Minister Mervyn Storey MLA this week co-hosted a Jobs Fair in the Joey Dunlop Leisure Centre in Ballymoney. The event, held on Thursday, had over 35 businesses and other exhibitors in attendance, all of whom were either directly promoting employment opportunities within their organisation or promoting initiatives to assist young people in finding employment. Mr Storey explained “We are absolutely delighted at the response we received from local businesses when we approached them about the fair. No fewer than 24 of the participating businesses are actively recruiting for specific posts within their organisation here today. For the last three months unemployment in North Antrim has reached its lowest point (5%) since before the last General Election in 2010, well below the Northern Ireland average of (6.3%). Ian Paisley has called upon the government in London to open a fresh period of consultation with regards to the re-locating of all of the UKs motor vehicle licensing administration to a centre in Swansea, which commenced earlier this year, closing all centres across the rest of the UK in the process, costing thousands of jobs. Mr Paisley commented ‘There was cross-party solidarity from all of the Northern Ireland representatives in Westminster objecting to these proposals. We could not stress enough how important it was that Northern Ireland centres, especially the centre in Coleraine which employed over 300 staff, should be left out of this re-structuring given the complexities that are unique to this country as the only member of the United Kingdom who share a border with a non-UK nation. A delegation of NIPSA staff and MPs met with the Department of Transport on various occasions in London to air their concerns to the government as well as delivering a petition directly to Downing Street containing over 30,000 signatures objecting to the closures. “We left those various meetings feeling positive, not only by the fact that we had been granted them in the first place, but also by how understanding the department appeared to be with our arguments. Therefore it was very disappointing when I later received written confirmation from the Department of Transport that the proposals to re-locate to Swansea were going ahead” said the MP for North Antrim. The Wright Group have today announced the order of over 400 buses to be exported to Singapore. The order, which will be manufactured in Ballymena will effectively build the buses in ‘flat pack’ form before exporting them. The company already have strong trading links with Singapore and this latest order will add to the 1015 buses that have already been purchased by SBS transport in Singapore from Wright Group, which will bring the total number on the roads to 1430. WrightBus place a lot of emphasis on their commitment to renewable energy and are leading the way in incorporating climate friendly products. Last month the company announced their latest office in Abu Dhabi in the Middle East. The area of Abu Dhabi where the offices will be based, Masdar City is powered entirely by renewable energy as part of a government initiative to develop sustainable working and living. North Antrim MP Ian Paisley has expressed his delight at the announcement from the Wright Group of the creation of 130 new jobs based at their Antrim site. The jobs, 70 of which have already been put in place will average a salary of £19.5k. The remaining posts will be filled over the course of the next two years. North Antrim MP Ian Paisley has suggested that the decision to close the DVA centre in Coleraine was short-sighted and has not taken Northern Ireland specific considerations in to account. Mr Paisley was reacting to a letter received from the Parliamentary Under-Secretary of State for Transport Stephen Hammond MP which confirmed, despite strong opposition to the proposals which look set to cost 300 people their jobs in Northern Ireland, that the government will proceed with the closure. The Northern Ireland Public Service Alliance (NIPSA) has been working to try and persuade the government to reverse their decision ever since it was first proposed almost two years ago. Representatives of NIPSA along with a group of Northern Ireland MPs including Mark Durkan of the SDLP and Mr Paisley’s DUP colleague Gregory Campbell presented a petition to 10 Downing Street with over 20,000 signatures assigned to it. However Mr Paisley has claimed that the government have made no acknowledgement of the different dynamics of vehicle licensing in Northern Ireland from that in the rest of the UK when making this decision.